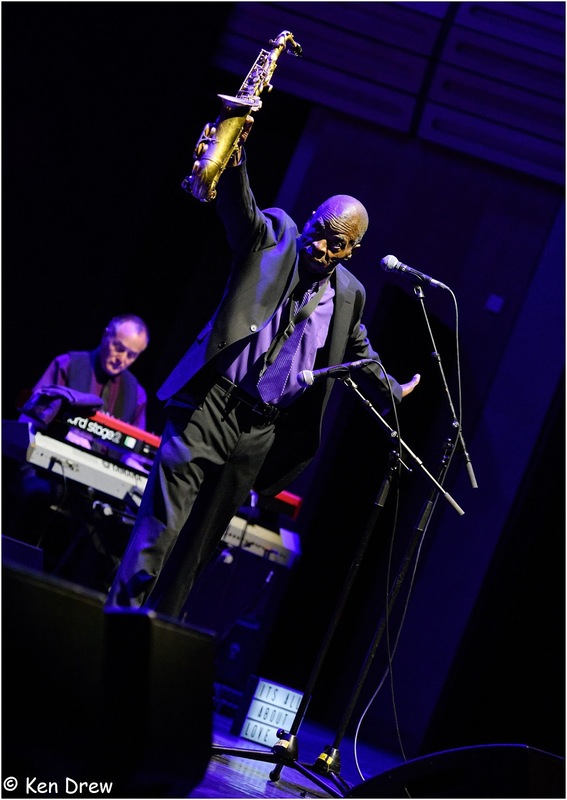 bebop spoken here: GIJF 2018: Maceo Parker - Sage Gateshead, April 7. GIJF 2018: Maceo Parker - Sage Gateshead, April 7. (Review by Steve T/Photo courtesy of Ken Drew). A couple of tabla players in the next room, and after seeing Talvin Singh in Sage 2 a couple of weeks back, I've got my tabla back on: looking for a set, tutorial DVD, maybe even lessons. But Maceo's in my blood. Last time I saw him he wasn't that great, playing very little in the last hour, leaving it to guest fellow James Brown alumni Pee Wee Ellis, so I wasn't too hopeful; but he's in my blood. As the band rolled on: Rodney Skeat, another former colleague, this time from the P Funk All-stars, setting up an all but constant funk bass-line, and one of the great British Jazz trombone players and no stranger to funk, Dennis Rollins. Maceo's partnership with bone legend Fred Wesley was the powerhouse of Brown's backing band the JB's and then the Parliament, Bootsy, Brides and Horny Horn section of George Clinton's P Funk empire. Papa's got a brand new bag (more or less) and some welcome P Funk references - 'I wants my funk uncut'. In her introduction, Ros Rigby noted that James Brown had played at Sage Gateshead, which was perhaps the best night in its history and one of the most important, but failed to note that Mr Clinton, the man who poached Fred, Maceo, Bootsy and others from James, played there a few years back too. Maceo has always gone for the Brown angle, but perhaps with the presence of Skeats, brought some P along too. I'm like Mingus, accepting the genius of Bird but acknowledging Duke was still his man. I came to love P Funk but James was the father of Gods. Make it Funky is standard James Brown/JB's before he introduced some Jazz, claiming they don't play Jazz. The links between Jazz and Funk are vast and the influence of Jazz on Funk is undeniable, though for decades it's been two-way traffic. The Jazz-Funk sub-genre emerged in the late sixties and survives to this day, though it's always been derided by Jazz purists (while funk people just call it Jazz). Fred Wesley always thought of himself as inferior to Jazz musicians and was thrilled when he was given the opportunity to record Jazz with 'proper' Jazz musicians. Perhaps they think the Jazz crowd expects zillions of notes per nano-second. We were given a short, speeded up Jazz interlude (Satin Doll - Ed.) by Maceo and his keyboard man, using Hammond sound, before a trombone showpiece with just keyboard. Rollins has no qualms about Jazz and gave a truly superb rendition of When I Fall in Love, on what I always think must be a really difficult instrument to play well. A bit of Marvin Gaye's Let's Get it On, led by guitar, was straight into Cold Sweat before a rather bizarre Ray Charles impersonation, followed by a hint of Chain Gang and a full-blown feature for singing cousin Darlene Parker with Stand by Me, Maceo briefly switching to flute. I always hate it when soul acts do the Blues Brothers, Commitments, BBC version of soul: I'd rather listen to Maceo Parker than Ray Charles, Sam Cook or Ben E King. One of the tracks that made Maceo a famous name was the JB's Doing it to Death, often known as Funky Good Time, featuring James calling on Fred then Maceo, but here it was Rollins who took us higher. Another JB's biggie Pass the Peas, another James Brown classic Soul Power before the Isleys Lay Away finally brought things to a close. He was more animated in his playing and introductions than I've ever seen him before. His playing was fluid and assured throughout, with that sound that's recognisable to any funk fan. Despite a dip towards the end, this was well worth it, but he's in my blood.